New website celebrates our 21 years on the World Wide Web! We first registered our www.elizabeth-foundation.org website domain on 19 January 1998 – so 21 years ago today. We are celebrating with a brand new website! We’ve come of age and are delighted to be able to launch our new website, created completely in-house by our digital media manager. We wanted to move with the times, so our new website is now easier for you to view on smartphones and tablets as well as computers. We have also refreshed all of the website content, and have added new information – such as a page of advice and guidance for parents of newly diagnosed children. Our new website is also easier for us to update, so we can keep you informed about our latest news and events. And for the first time ever we now have an online shop – and we would welcome your suggestions for any additional products you would like us to stock. We wanted to show you our new website as soon as possible – so it is still a work in progress. We are beavering away behind the scenes to add new features, such as the ability to register and buy tickets for our fundraising events. Our online presence has certainly come a very long way since 1998 and we are confident our new website provides the best possible platform for our continued online success. We hope you enjoying exploring our new website. Please let us know what you think about it – and if there is anything else you think we should add. Subscribe now to receive regular email updates about our charity activities and fundraising events. Copyright (c) 2019 The Elizabeth Foundation. 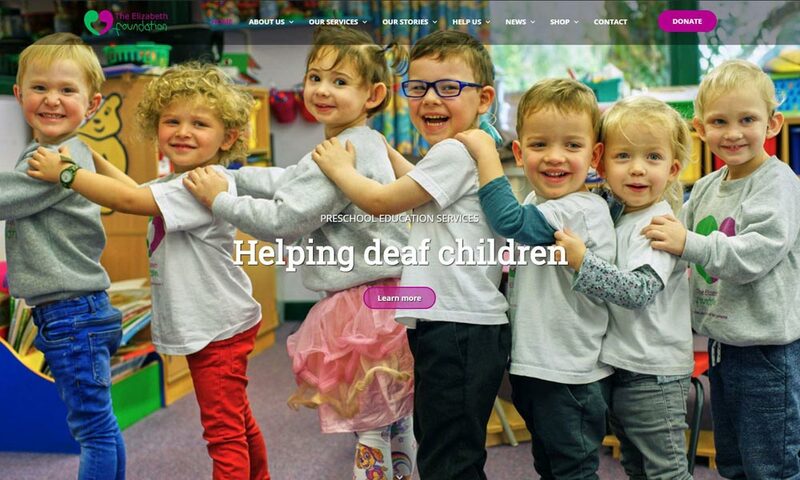 Support us in helping preschool deaf children find their voice!